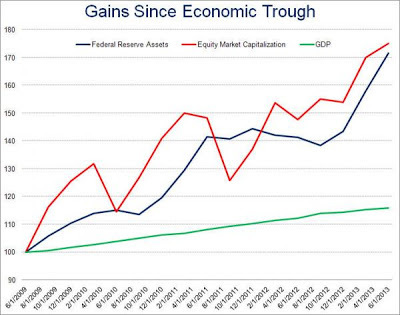 While the Fed’s first round of quantitative easing helped to end the financial-market turmoil that occurred in the depths of the recent crisis, two subsequent rounds – including the current, open-ended QE3 – have done little to alleviate the lingering pressure on over-extended American consumers. Indeed, household-sector debt is still in excess of 110% of disposable personal income and the personal saving rate remains below 3%, averages that compare unfavorably with the 75% and 7.9% norms that prevailed, respectively, in the final three decades of the twentieth century. Treasury bond yields have spiked. The Fed's began with lowering short-term rates, progressed to buying Treasuries further out on the yield curve and finally added agencies to its purchases. Now that the Fed has signaled that it is considering winding down its QE program, Treasury yields have spiked. 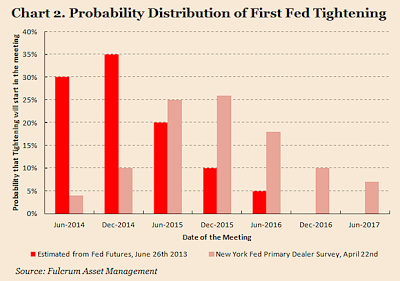 It has caused carnage in the Eurodollar market. If you hold down short rates and then tell the world that you expect to hold short rates at zero or near zero for a long, long time, it is an invitation to Mr. Market to put on a carry trade - and it did, with leverage. The signal of reversal is causing these carry trades to unwind, the most obvious of which is the "get cheap funding and buy Eurodollar deposits" trade. See Vince Foster's Minyanville article Bernanke's Misfired Shot Heard 'Round the World. Other carry trades like the currency carry trade are being unwound in a disorderly manner. The Fed's implicit encouragement for the market to take risk pushed funds into junk and emerging market bonds. We have seen how investors reached for yield in the last few years, some of that money made its way into lower quality credits like junk bonds and emerging market bonds. In particular, the emerging market bond market has sold off in a frenzy. In addition, it has caused stress in a number of EM currencies as the market has begun to re-calibrate risk premiums. Over the last two years, and especially in 2013, mainland corporations with offshore affiliates had been borrowing money abroad, faking trade invoices to import the money disguised as export revenues, and profitably relending it as Chinese yuan. As China receives more dollars from exports and foreign investment than it spends on imports and Chinese investment abroad, the People's Bank of China, the central bank, is forced to buy those excess dollars to maintain the value of the yuan. It does this by borrowing yuan in the domestic markets. But because its borrowing cost is greater than the return it receives when it invests those dollars in low-earning U.S. Treasury bonds, the central bank loses money as its reserves expand. Large companies bringing money into the mainland also force the central bank to expand the domestic money supply when it purchases the inflows, expanding the amount of credit in the system. In May, however, the authorities began clamping down on the fake trade invoices, causing export revenues to decline. Foreign currency inflows into China dried up, as did the liquidity that had accommodated rapid credit growth. The combination of rapidly rising credit and slower growth in the money supply created enormous liquidity strains within the banking system. This is probably what caused last week's liquidity crunch and this week's market convulsions. When Pettis wrote that Chinese companies imported foreign money and engaged in the practice of "profitably relending it as Chinese yuan", he is referring to injections into China's shadow banking system, which is really their subprime market. In a separate note, Izabella Kamanska of FT Alphaville also documented analysis from Deutsche's Bilal Hafeez indicating that the tight USD-CNY relationship was ripe for a carry trade. Tapering talk has devastated the TIPS market. As the market has contemplated the reversal of QE, inflationary expectations have plummeted and so have the price of TIPS. QE first buoyed commodity prices and now we are seeing the reversal of that trade. Gold and other hard commodities benefited from low and negative real interest rates. Now that we are seeing real interest rates rise (and inflationary expectations fall), commodity prices are getting hammered. Tapering talk has also implicitly hurt Europe. The ECB has been able to stabilize the eurozone with Draghi's "whatever it takes" remark and the unveiling of its OMT program, which has not been activated yet. Yield spreads of peripheral countries' bonds against Bunds have narrowed because of the ECB's threat of action, along with the flood of global liquidity. Now that the flood of global liquidity is starting to recede, the ECB may actually have to resort to OMT, which would cause another round of euro-angst and more risk premium re-calibration. I've probably forgotten or missed out on some other side effects of the various rounds of Fed QE, but you get the idea. Many of these bets were leveraged bets as they were designed to help banks profit and repair their balance sheets, e.g. the Eurodollar carry trade. When these trades unwind, the effects will not a blip, but a tsunami. All these macro effects are suggesting that we are at the start of a risk re-pricing process that will take months to complete. It will not be friendly to asset prices at all. In the US, stock prices are starting to face headwinds from a deteriorating earnings outlook. Ed Yardeni documented that while Street earnings estimates continue to rise, forward sales estimates are falling. How long can this divergence continue? Can margins continue to rise? Rather than using cash to pay down debt, companies in the S+P 500 Index are attempting to boost their share prices by buying back almost $700 billion of stock this year, approaching the 2007 record of $731 billion, said Rob Leiphart, an analyst at equity researcher Birinyi Associates in Westport, Connecticut. Borrowers controlled by buyout firms are on pace to raise more than $72.7 billion this year through dividends financed by bank loans, surpassing last year’s record of $48.8 billion, according to S+P Capital IQ Leveraged Commentary & Data. After cutting expenses as much as they could to improve profitability, companies “will need to see further revenue growth to boost earnings from here,” Anthony Valeri, a market strategist in San Diego with LPL Financial Corp., which oversees $350 billion, said in a telephone interview. All these factors add up to bad news for the stock market. The good news is that any pullback is likely to be relatively minor and the possibility of a market crash is remote. The Fed has made it clear that it continues to be "data sensitive" and will adjust policy as necessary. Translation: The Bernanke Put still lives. There are three ETFs I am watching very closely for gap closes. My motivation is twofold: first, I want to short the everloving bejesus out of them once the gaps are filled, and second, it’s going to be my signal to go balls-out shorting the equities in general. As I write these words, the gaps in HYG, JNK and MUB have been filled. However, my inner trader is not ready to short "the everloving bejesus" out of this market yet. He is more inclined to pivot from a pure US-centric view to a more global macro view of the world and he is watching how the gaps in the ETFs of some of the aforementioned sectors that were affected by the Fed's QE actions are resolving themselves. DBV, which is the ETF representing the currency carry trade, has seen its gap filled. Commodity ETFs, however, aren't performing that well and they continue to be in a downtrend without rallying to fill their gaps. Here is DBC, as a representative of the entire commodity complex. DBC violated a key support level and continues to weaken. It has seen no rally attempt to fill in its gap. Gold (GLD) is one of the ugliest charts of all. Note, however, how it rallied back in April and May to fill in the gap (shown in green) but it continues to weaken and has shown two gaps (in yellow) that have yet to been filled in a relief rally. What about Europe? The chart of FEZ representing eurozone equities below shows that while we have seen a minor relief rally, eurozone equities have not rallied up to fill its gap. Here's the score. Sectors with filled gaps: 3; unfilled gaps: 2. My inner trader's conclusion is that the relief rally isn't quite finished yet. We are likely to see several weeks of volatility before the process is complete before the longer term fundamentals of the recalibration of risk premiums pushes asset prices lower. Watch these lines in the sand! Should you have sold in May?